The Department of Energy -- a mainstay of the West's economy -- is in serious trouble. 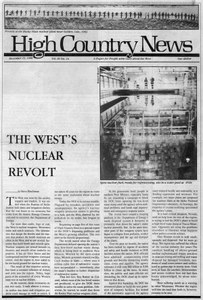 Plagued by mistakes, accidents and incompetence, the Department of Energy's nuclear weapons production system is grinding to a halt, and the West, alarmed by the pollution in its midst, has begun to revolt. INEL employs more than 10,000 workers, or 2.5 percent of Idaho's work force. Only the state government itself employs more people. But it comes with a legacy of pollution. The U.S. Department of Energy and its private contractors aren't ready to open the first nuclear waste dump in the world. Today, nearly 10 years old, almost fully constructed and containing $700 million in hardware, the Waste Isolation Pilot Project lies in a state of limbo.